Have you thought about becoming a vegetarian, but not sure where to start? A good first step is to replace meat in recipes with legumes instead, such as garbanzo beans, which are also known as chick peas. Legumes provide protein, just like meat does, but without any animal fat. Legumes also are a good source of soluble fiber which helps lower cholesterol. This is a heart healthy recipe perfect for a meatless Monday dinner! Prepare the dried garbanzo beans according to the package instructions - there is usually an overnight soak or a quick soak. The beans take a lot longer than what is stated on the package, so try using about half to three quarters of the 1 lb bag. Next, take 2-3 cloves of finely chopped garlic, one medium shallot, medium onion and carmelize them in a nonstick pan with a few tablespoons of olive oil. Tip: start the garlic, shallots, onions in the room temperature oil and cook on very low heat to try to prevent burning. While they are carmelizing, take about 1/2 of a package of sundried tomatoes and rehydrate in 1-2 cups boiling water and set aside. Once the onions, garlic, and shallots are carmelized, add the garbanzo beans, and strain the sundried tomatoes. Then chop the tomatoes coarsely and add to the carmelized onions, garlic, shallots, and garbanzo beans. Hold onto the water that rehydrated the sundried tomatoes and use it to cook the couscous in. 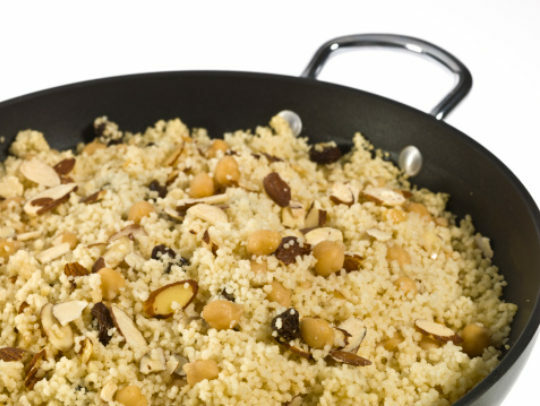 Prepare as much couscous as you would like (I usually do 4 cups which require 1.5 cups water). If you do not have enough of the sundried tomato water you can add water or use vegetable stock to make the couscous for added flavor. Once finished, mix together and enjoy! For added protein, you can try it with a scoop of Greek yogurt on top.